Dr. Salina Wydo and Dr. Tanya Egodage accept a plaque of recognition from CCPD Chief J. Scott Thomson on behalf of the Cooper Trauma team on Thursday, January 31, 2019. Members of the Cooper Trauma team were recognized for saving the lives of two Camden County Police Department officers in 2018 during a ceremony held to honor those officers on Thursday, January 31, 2019. 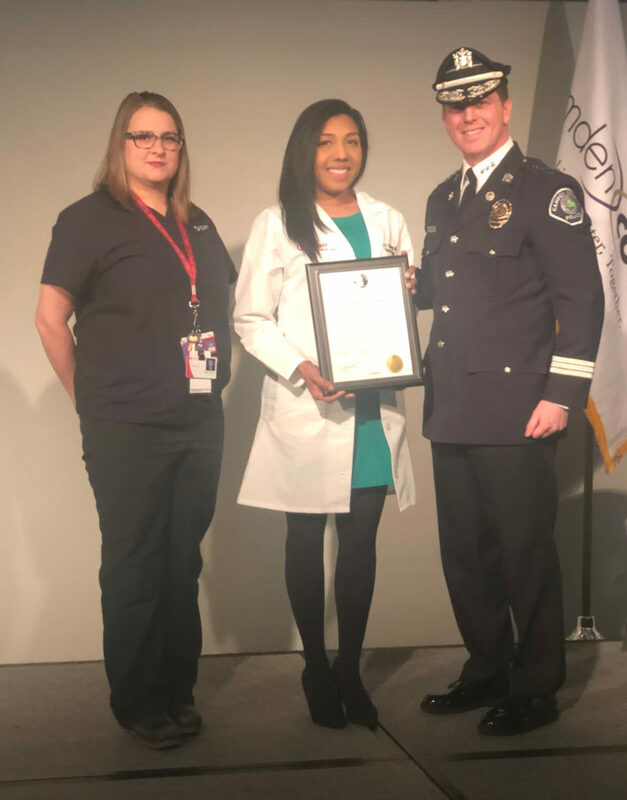 Dr. Salina Wydo and Dr. Tanya Egodage were able to attend as representatives for the physician and nursing staff, and were presented a plaque and certificates by CCPD Chief J. Scott Thomson. As a Level I Trauma Center located in the heart of Camden City, Cooper is proud to provide this level of care for all members of our community and region.